It’s not every day that TV star, producer, and all-around entertainment powerhouse Amy Poehler is asked to work as a stand-in. But it’s also not every day that a former First Lady and current candidate for president stops by a show about pothead slackers, friendship, and bizarro adult babies. 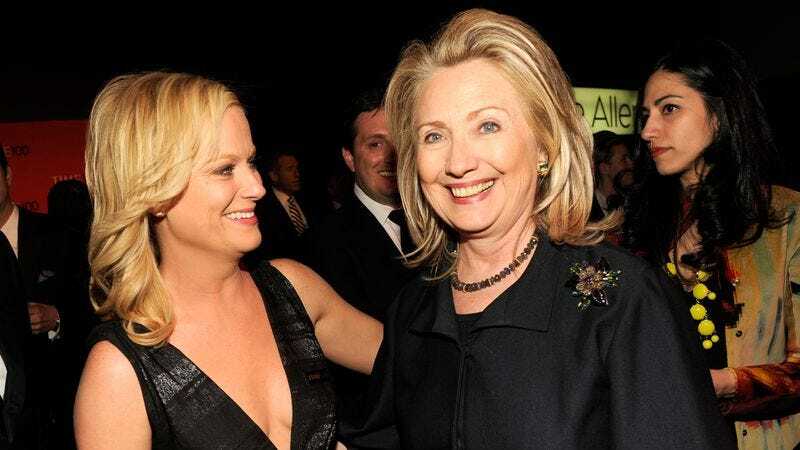 So when Hillary Clinton appeared on the third season of Comedy Central’s Broad City earlier this year, Poehler apparently stepped up to save the candidate from having to stand around all day while Abbi Jacobson and Ilana Glazer filmed reaction shots. Jacobson was promoting her new project, Carry This Book, in which she draws the contents of various public figures (including Clinton’s) bags. Besides discussing the book’s inspiration—Tim O’Brien’s Vietnam War-era short story collection, The Things They Carried—she also talked about meeting Glazer for the first time, and confusing her with Arrested Development’s Alia Shawkat.